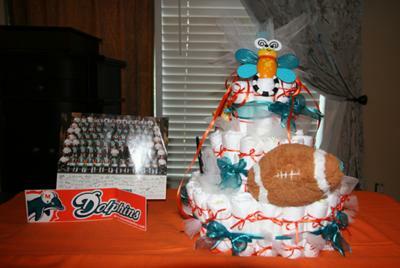 Such a good looking diaper cake! 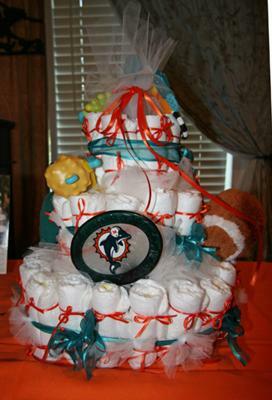 Love the dolphins theme, and the detail on this cake is lovely - each diaper is tied with an individual bow and the three kinds of ribbon give it such a classy touch! Kelli is one of our fabulous readers who wanted to share her diaper cake with us to continue the spirit of this diaper cake gallery - a place to get and give diaper cake ideas, to gain inspiration and then turn around and inspire others with your creativity. I love our readers! 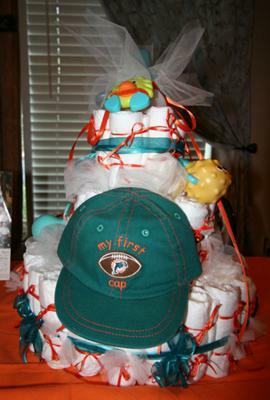 Kelli, thanks for sharing your pretty diaper cake and your helpful instructions!